Fresh fruit juice is good for you. We all know that! We’re always being told to make sure we get our 5-a-day – our 5 portions of fruit and vegetables every day – and now scientists have shown that fresh fruit juices, especially those from grapes, cranberries and apples, are high in antioxidants that are especially beneficial to our health. And a glass of fruit juice counts as one of our 5-a-day. 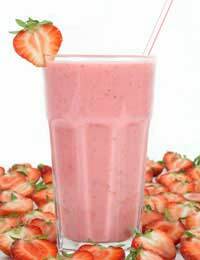 Fresh fruit juices and smoothies can be made very easily at home with just a little extra kitchen equipment. You probably have a blender or liquidiser in your kitchen already. A blender is ideal for whizzing soft fruits to make a smooth fruity drink, or to combine soft fruits with yogurt, milk or ice cubes for a healthy milkshake or smoothy. You get the whole fruit and all its fibre and goodness in a form that’s palatable to even the fussiest child. If you want to make apple or pear juice, carrot or beetroot juice, then you need a juicer. The juicer will take the raw ingredient, such as a carrot, and separate it into the vitamin- and mineral-rich juice and raw pulp. You may drink the juice as it is or combine it with other ingredients in your blender to make a health-giving cocktail. Fill a colander with grapes, stalks and all. Pour a cup of water in the bottom of a saucepan and place the colander on top. Cover with a tight-fitting lid. Bring the water to the boil and then let it simmer very gently for about 30 minutes. Check now and then to make sure the juice is flowing and the pan’s not drying out. Remove from the heat and mash the juice out of the colander into the saucepan. Discard the skins and stalks. The juice is now ready to drink as it is or diluted with water. While it’s still hot add honey to taste if required.Keep in the fridge. Use fresh fruit that is ripe, don’t be tempted to use old fruit and vegetables! Wash all fruit and vegetables first unless you are confident that the products are organically grown and pesticides have not been used (you may want to remove the peel.) You should peel oranges, waxed lemons, grapefruits, pineapples, melons and kiwi fruits and remove seeds and stones – except from a watermelon. Cut into pieces that will fit easily into your juicer. Cut the fruit into teaspoon-sized pieces for the blender. Simply pop the fruit and vegetables through a juicer and serve with ice if required. Whizz solid ingredients for a few seconds first and then add liquids and/or ice and blend until smooth. Blend the banana, cranberries, peaches and their juice until smooth. Add orange juice until the consistency suits your taste. While juice is good for children in moderation, taken in excess, the acid and sugar in it can contribute to obesity, tooth decay and gastrointestinal problems. Babies under six months shouldn’t be given juice without the advice of the doctor, and those under 6 years should have a maximum ¼ pint of juice a day. Try to encourage them to eat fruit instead.